These days I am completely obsessed with the statement necklace- but not any statement necklace- the handmade- chunky bead variety. 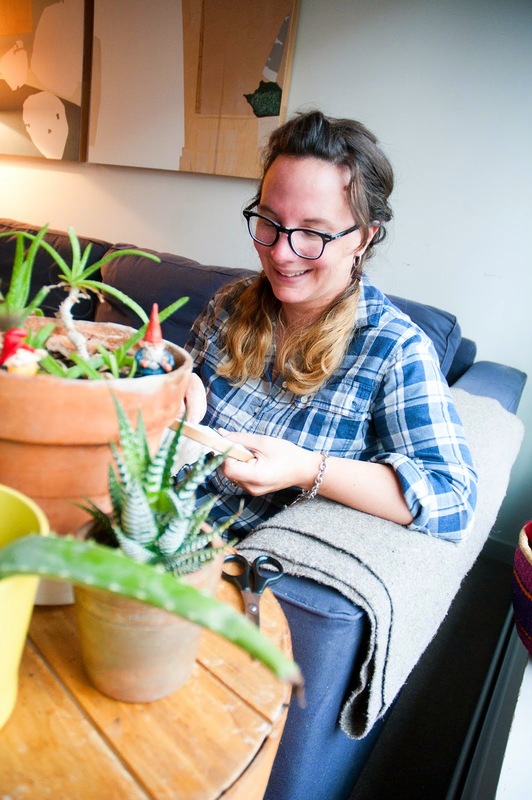 So it was only natural that I would start to make them myself at the studio- the bigger the better! I'm totally loving how these beads are turning out- especially when pared with some chunky indigo dyed cotton rope. I'm feeling super inspired by my surroundings these days and it's indigo for days- blue on blue on blue! The perfect pallet for these balmy summer days! Friends it's Friday again- the days are just flying by so swiftly I can barely contain myself. This weekend we are hoping for a chilled out couple of days- so if you need me you can find me dockside with a fine glass of boxed wine! Happiness and Sunshine always Friends! With Summer vacay right around the corner the conversation out on the playground is turning towards vacation plans. Over the past few days I have been involved in a number of conversations with parents talking about the spontaneous mini close to home adventure- of which our family is a huge fan of. 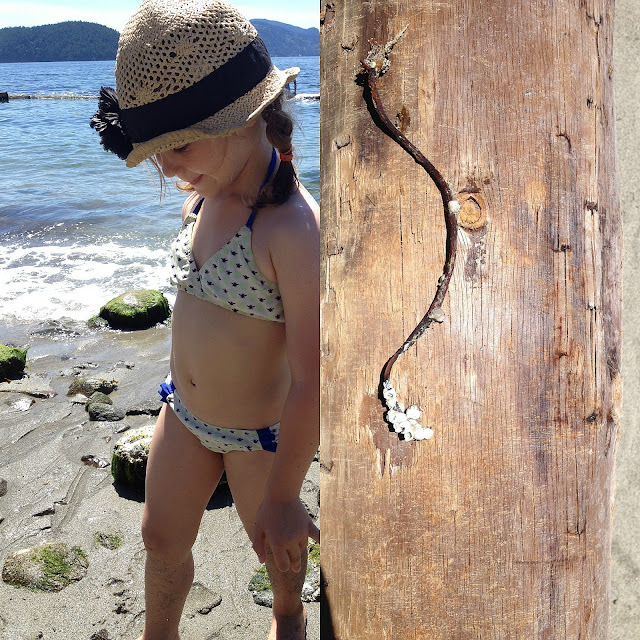 Each weekend we really try to get out and enjoy what our beautiful province has to offer- it doesn't need to be a big trip as long as we are outside and together- weekends are sacred. To make these short day trips successful there are a few things I have learned along the way- I thought I would share my wisdom- or at least share the things I have learned through trial and error! First and for most my biggest tip is to get up and out the door- if our family isn't out of the house by 10am then our chances for fun in the sun dwindle by the minute. Our family does not idle on the weekends- yes we sleep in and have a big hearty breakfast and then we are out the door! Pack lunches, drinks and loads of snacks- there is nothing worse than getting halfway to Squamish and hearing the incessant whinging of a hungry seven year old! We try and mix up our weekend picnics so our kids aren't board by yet another homemade lunch. I like to BBQ enough chicken or meat on Thursday or Friday evening to carry us through our weekend lunches. Small snacks like hummus in a jar and fresh cut up veggies on the go add novelty that they don't see during the week. One rule in our family is that everyone carries their own water and snacks- so we have all invested in good quality water bottles that can be filled with ice and water for warm days. A fun and healthy snack like individual trail mix or fruit salad goes into the Littles backpacks- along with their essentials. Everyone is responsible for their own gear- each of our Littles has a really decent backpack- into those backpacks goes all of their essentials for the day- a sweater, extra socks, hats, a small toy or drawing materials along with water and snacks. This tip means that Momma doesn't end up carrying all of the things. It also teaches each Little some self sufficiency- if something is missing from their packs there is only one person to "blame". 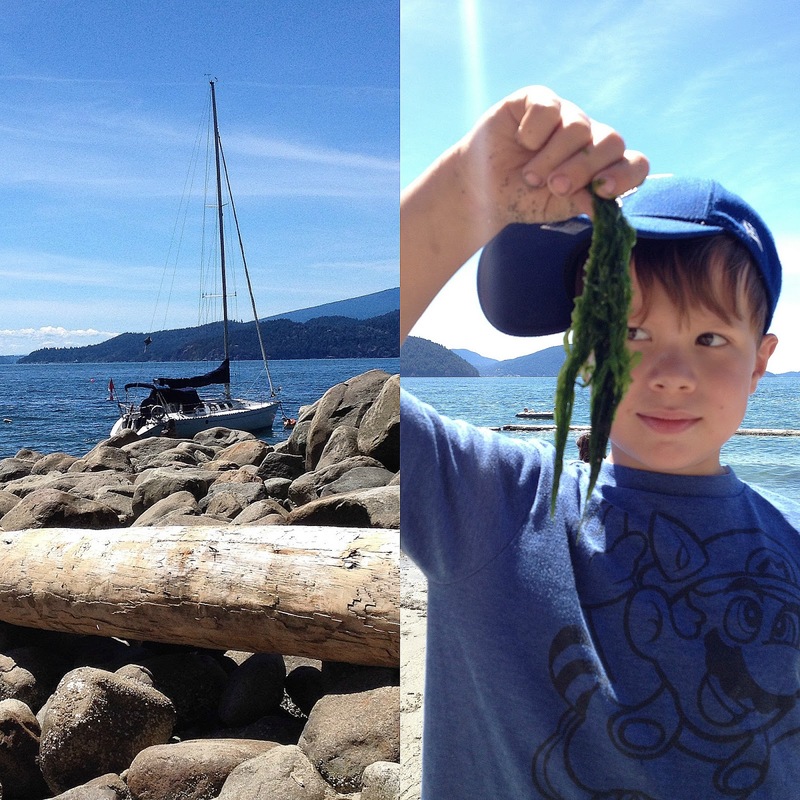 Incidentally in case you are wondering these happy pictures were taken the other day out in Lion's Bay- a perfect, tiny sand beach just North of Horseshoe Bay. We headed out there on Father's day where I had an excellent nap on the beach and did some knitting while dear old Dad made sure no one drowned. 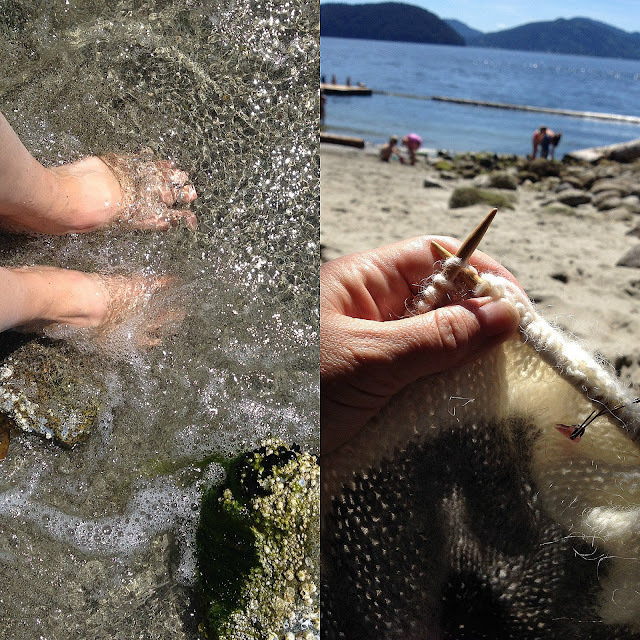 We hunted for crabs, dug some holes and generally soaked up way too much sun- just the way a beach adventure should be! Hi Friends! Boy when I planned on taking a short blogging break two weeks ago I had no idea that time would get away from me so quickly! The end of our school year has been filled to the brim with all sorts of special visitors- so many great memories made that I could not even put it all into words. Our dear friends from New Brunswick were visiting for some time- as were my parents and more friends from up-Island- being surrounded by so many wonderful human beings I had no choice but to just pause and soak it all in. So here we are at the end of our school year- my Littles are not so Little anymore- growing like weeds and becoming big kids more and more each day. It's really difficult for me to wrap my head around how my Littlest is finished Kindergarten- both kids are in grade school now! They have both come so far this year- lots of struggles interwoven with many successes- it's cliche to say but this year has been so full of hills and valleys. 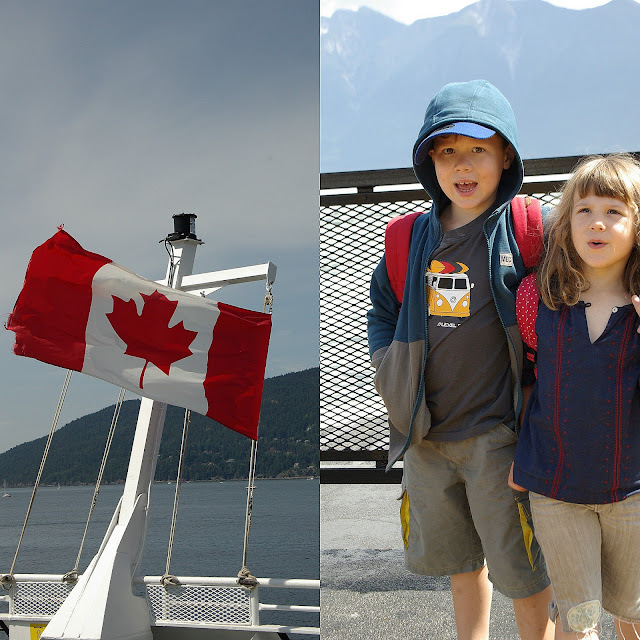 Heading into the summer we are all excited to slow down a bit- we have loads of family weekend plans and some short trips in the works- lots of ice cream to eat and some trails to wander. I find it really funny that people lament summer vacations of yesteryear- "Give Your Child an Authentic 70"s Summer" or some such headline has been popular on social media these days. What I find hilarious is the fact that the 70's or 80's or whatever were not any better than today- in fact they were probably much more dangerous with the lax seatbelt laws and all. I think the real difference is kids in the past did not have all of the things at their fingertips- perhaps making them more resourceful. Children were left alone to their own devices- left to play with sticks and drink out of hoses. Sticks and hoses still exist and when families come together to explore or revisit these freedoms together it can be a beautiful thing. My kids won't be unplugging this summer- hey I'm a realist and I want to sit quietly with a glass of wine on my deck occasionally. What we will all be doing this summer is tuning in- to each other and to nature- tuning into our friends and family- the important things that sometimes get missed. 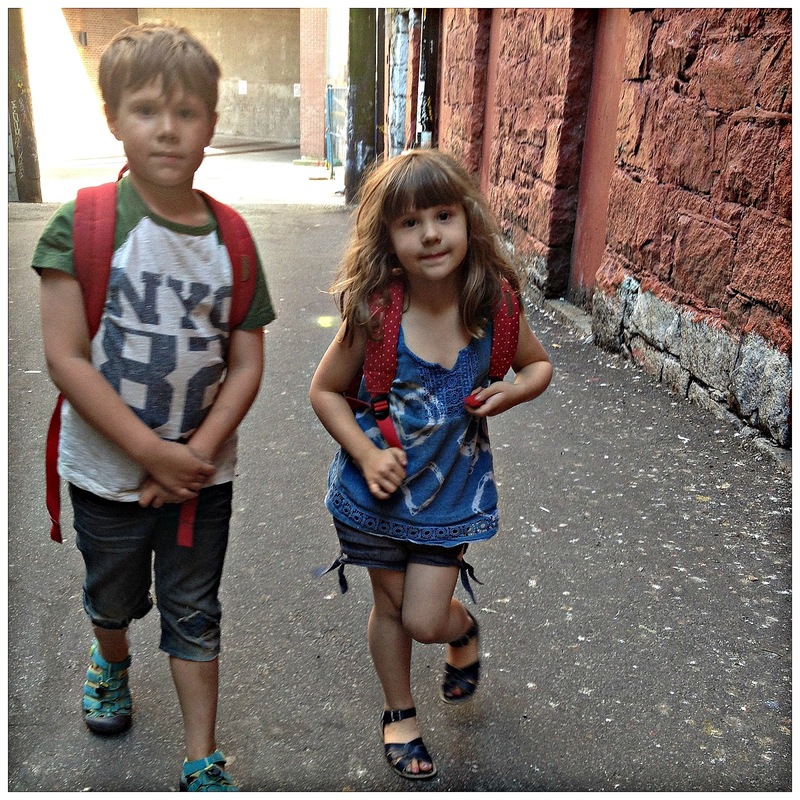 While our Littles have been growing and learning all year long so have we as parents- our lives have suddenly sped up now that our youngest was in full time school. 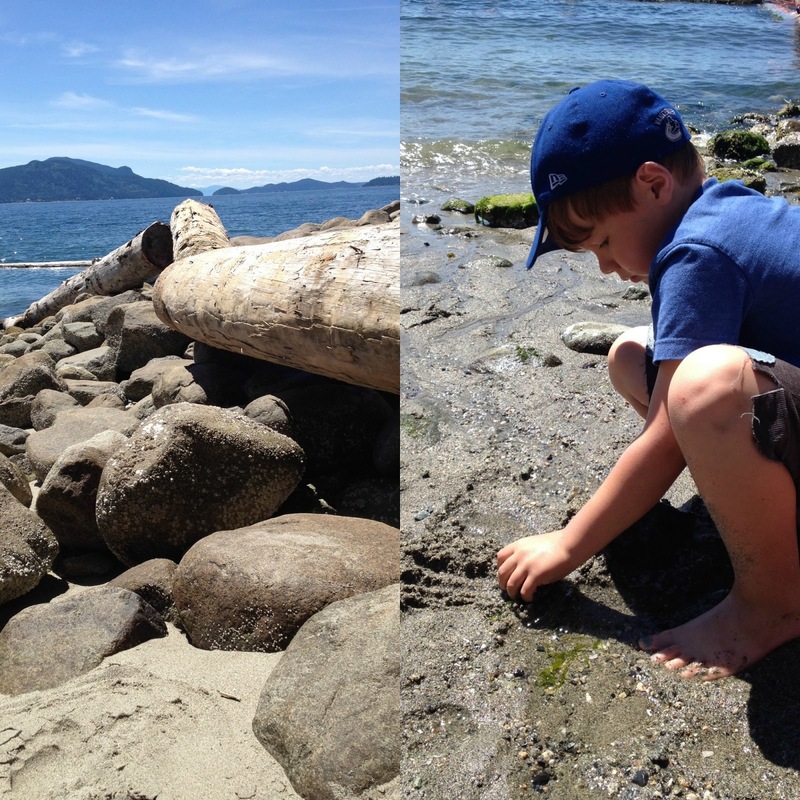 What I know to be true is that I miss the slow days of toddlerdom- the endless hours spent throwing rocks into the inlet or watching diggers. As a parent I can recognize how precious our downtime is and how important it is for us to connect with whats important every chance we get. 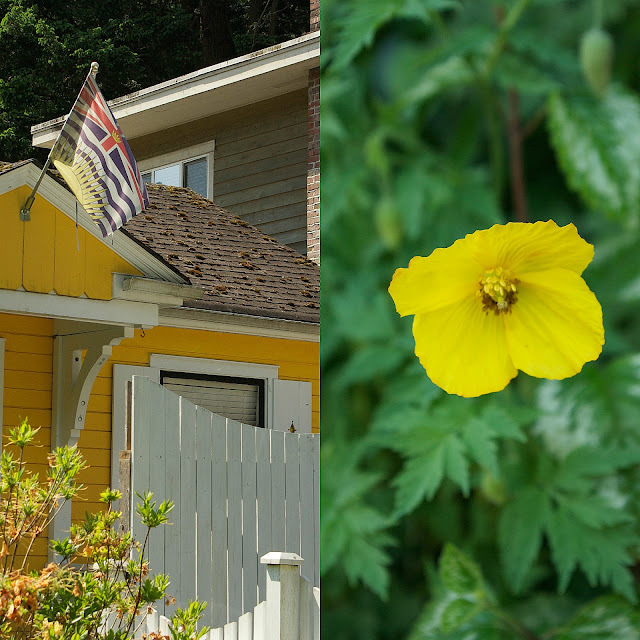 My girl has started showing a real back for photography- on a recent trip to Bowen Island she started collecting handfuls of buttercups, leaves and grass. When we stopped for a short rest she decided to style her little bouquet and take a few pictures on my big camera. Many parents would balk at the idea of letting their five year old handle an expensive DSLR camera- by teaching Miss Lo to handle it properly she will have the tools at her disposal to take wonderful photos. This girl of mine has a real eye for setting up a shot- I of course could not be a prouder Momma! Watching her stye her little bouquet with such care- she was so excited about the pictures she took. So it was only natural that I would get her photo printed for her. Opus Art Supplies has a wonderful digital printing service- ordering prints could not be easier or more affordable. It was so great handing my girl a professional quality print of her photo. 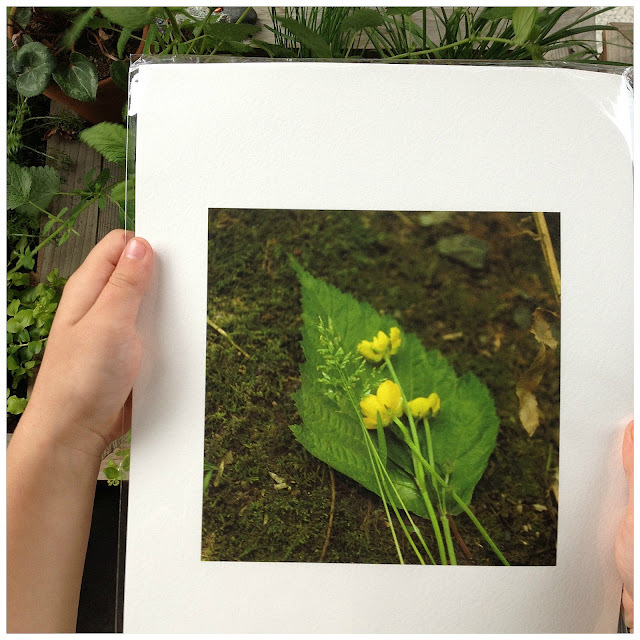 Digital printing is just another medium for our Littles to explore- so intuitive for them. 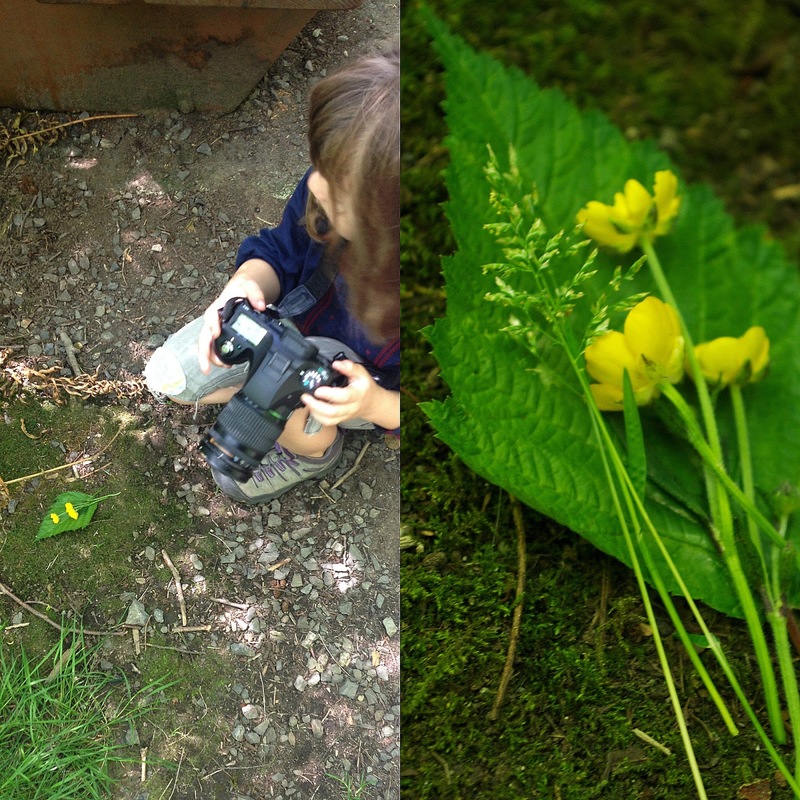 I think that it is so easy to look at children's artwork as basic or rudimentary but I just don't see that- digital photography is a medium that allows for glimpse at the world through a child's eye. In addition to allowing further creative expression digital printing is such a natural extension of our children's lives- their worlds are filled from the beginning with technology. In my opinion the photos my daughter takes and I get printed are no less creatively valuable that her wonderful paintings and drawings. I collect lots of things- some of these things are pretty intangible- sounds, textures, colours- ephemeral snippets of life that I don't want to forget. 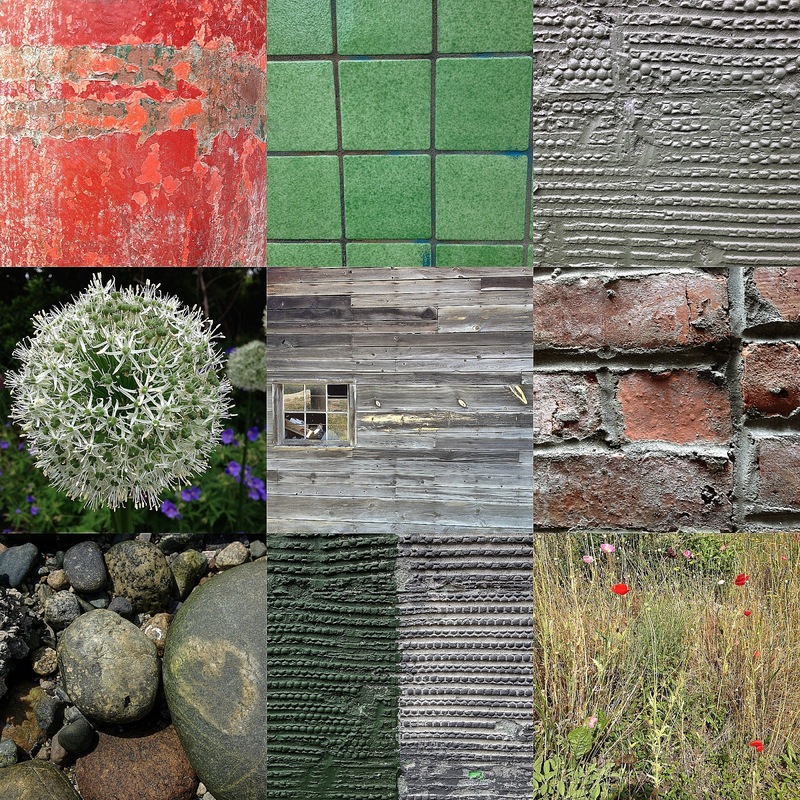 These collections are where I draw my inspiration from for paintings and now my ceramics- so many good combinations to reflect on. Often times we think of collections as something that we need to physically obtain- by collecting things that I can't bring with me it becomes more of a study in restraint. A well curated collection of things left behind! One of our favourite places to visit is Bowen Island- I have written a few times about my love for this place- stepping off the ferry in Snug Cove always feels like coming home. I love everything about this place- how it feels so much like where I grew up- Bowen Island is everything I could possibly want. And so it is no surprise that when we need to get away from everything and just regroup this is where we head. The disconnect between life in the city happens almost immediately- the short fifteen minute boat ride encourages all our worries to stay behind at the dock. Walking through the town really is just like what I grew up with- roving gangs of free range kids on bikes, skateboards and foot. 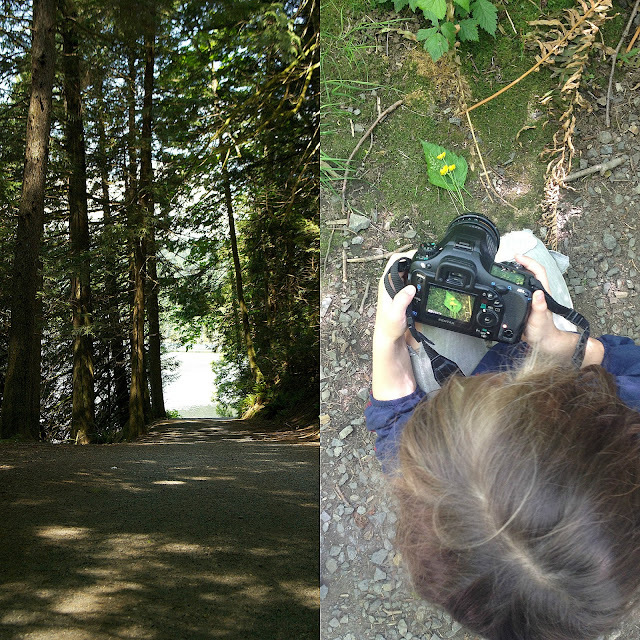 Our family of course heads straight for the forested trails that we love so- exploring and wandering as we go. 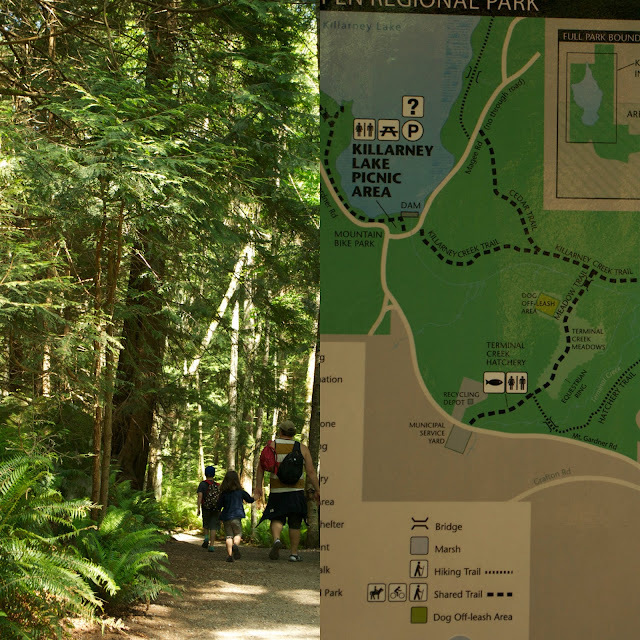 Into the forest- quiet nature calling our names we follow the trail starting in town and head for Killarney Lake. A stop at the fish hatchery is always a must- bugs, snails, frogs, sticks and snakes- so much for the Littles to stop and take in. 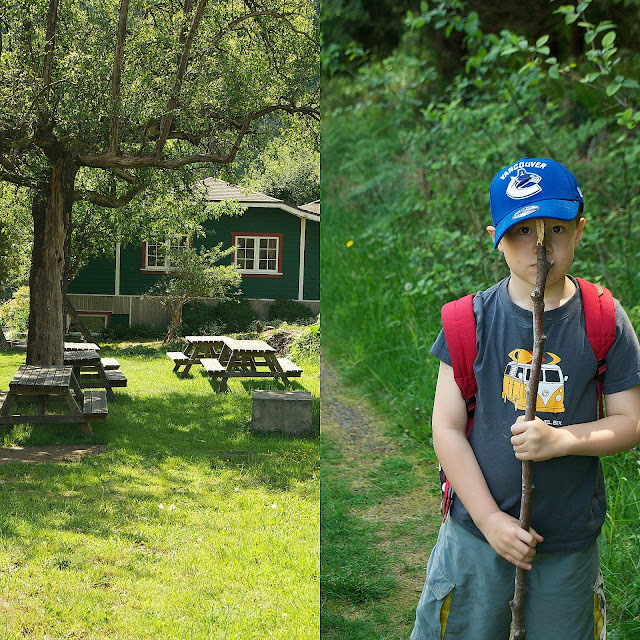 This visit was the first time we managed the loop to Killarney Lake and back- pausing for lunch in the fields by the equestrian ring- sandwiches in the sunshine. This year both our Littles are big enough to pack their own packs- for the most part of the day- Dad picking up the slack near the end of our hike when little legs get heavy. The trails to Killarney and around the island in general are quite easy for people of all hiking abilities- a nice easy stroll if one sticks to the trails. 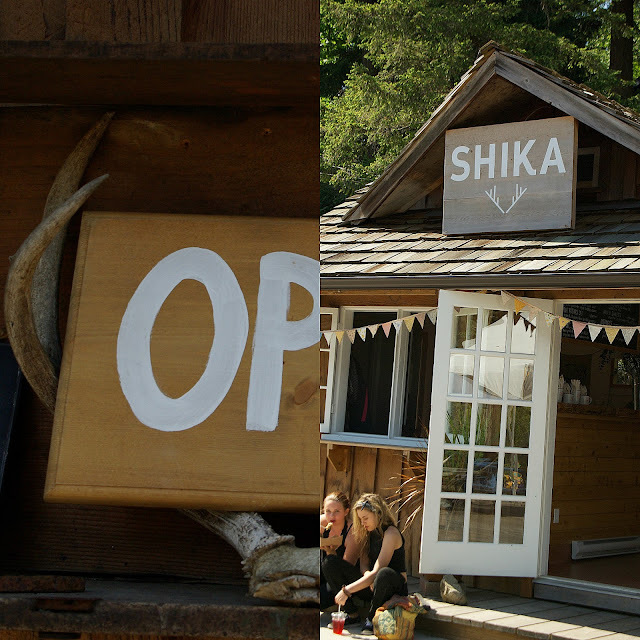 Of course there is so much in town to explore as well- down at the docks our favourite Shika is open for the season once again- stop in for a rice bowl or a cute plant. The ice cream stand is packed on a sunny day- we often opt for lemon slushies- a perennial fave. If one happens to hike up Bluebird Trail to Artist Square lots of cute shops and galleries can be found- my favourite Wren Boutique offering all sorts of goodness! Of course a stop at the smallest candy shop is a must and is often the bribe to walk just a little further- the promise of a sweet treat. 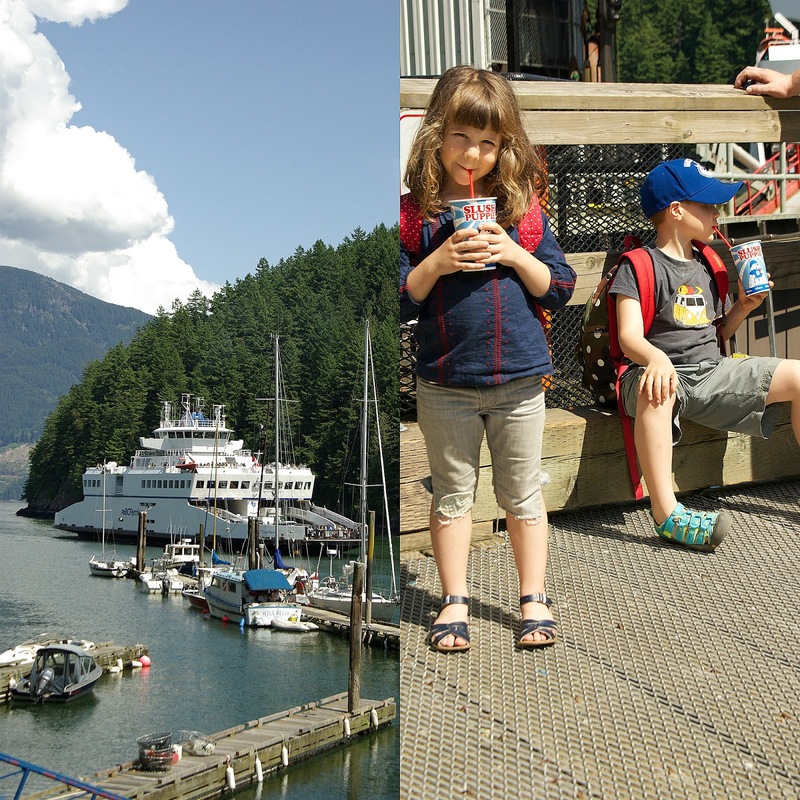 Bowen Island is truly one of my favourite day trips- it has everything a person could ask for- great food- great coffee- a brewery- wonderful little shops and galleries not to mention all the outdoor space a person needs. The proximity to Vancouver and transit make this such an accessible place to visit- would arguably make for a tolerable commute into work! A full day spent outside soaking in the sunshine and forest is often just what our family needs- topping us off for another week in the city.